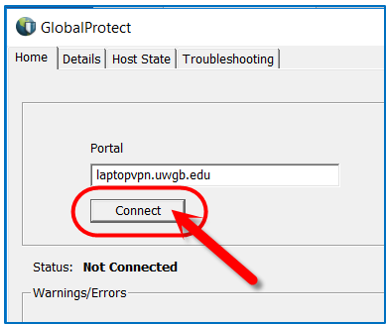 General settings for faculty and staff using a laptop with VPN. UWGB campus laptops running Windows 10 will have VPN enabled. 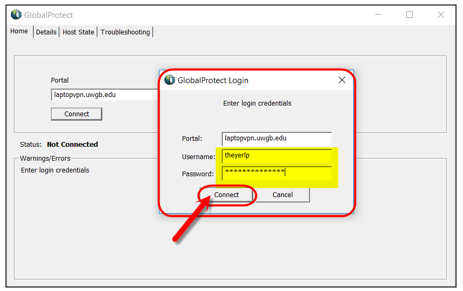 When VPN is installed, there are no local accounts that can be utilized, users must login with campus credentials. When on campus and not on a wired connection, the computer will automatically connect to the UWGB domain when logged in with a faculty/staff account. 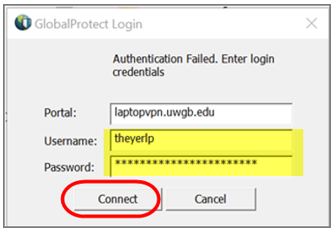 Each user for a laptop must logon to network while still on campus with either wired or wireless connection. Failure to do this will result in no account to use for login when off campus. A) Establishing your account on the Laptop (each user must do this). 1. Turn on the laptop, and press ctrl+alt+del to get to the log in screen. 2. Enter your current campus username and password. You must do this on campus if you want to use printers off campus. 2. Find your printer, right-click and choose ‘connect’. After logging in, ensure that you have a WIFI connection; if not, connect to one. 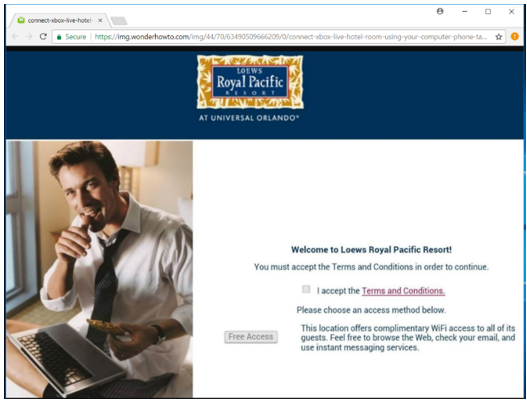 If you are using a network WIFI with a log-in page (hotel, resort), see the section on Captive Portals. If no WIFI is available, all data saved to this laptop will be saved locally and should be backed up. You’re connected to Wi-Fi and the Internet. A wireless adapter is detected, networks in range, but you’re not connected to one. No Wi-Fi networks found and not connected to WIFI. Check airplane mode. Airplane mode is on and WIFI is turned off. Check Airplane mode switch or Press Windows Key +A ? Network ? Airplane mode button to toggle mode. After a new WIFI connection is established, you will see a window pop up that displays "Select a valid client certificate". Select the GB# of your laptop and press OK.
1. Next, sign in with your username and password. 2. Wait up to 1-minute, and then check that you're connected by looking at the following icon. If it does not look like this, see RECONNECTING TO THE VPN. • When connected to campus domain, the globe will have a home symbol. • When connected to off campus WIFI, it will show as just a globe. • When disconnected the shield will be replaced with a red X.
Reconnecting to known WIFI networks will also automatically reconnect VPN. NOTE: When you move from network to network (home to UWGB, home to hotel) you may need to re-establish this VPN connection. 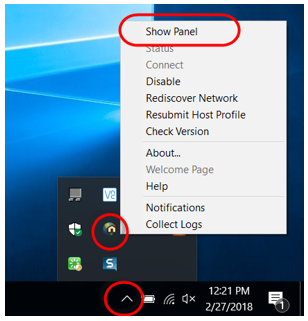 Just right-click on this VPN icon and choose ‘Show Panel’, then ‘connect’. This steps you again through the process of selecting the laptop certificate and logging in. Best Recommended Practice: You must ensure that you either Log Off or Shut Down the laptop before you bring it from one network/location to the next. If you do not, your VPN may not connect properly, and you may lose work. 1. You can use your M: drive exactly like you do on campus. 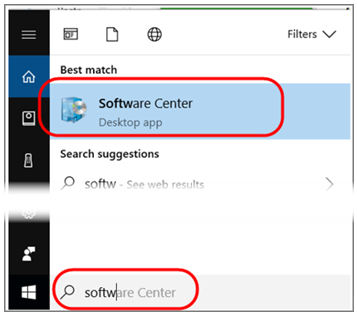 You can locate it using Windows Explorer and expanding “This PC”. 2. If you don’t see your M:\ drive, open File Explorer. 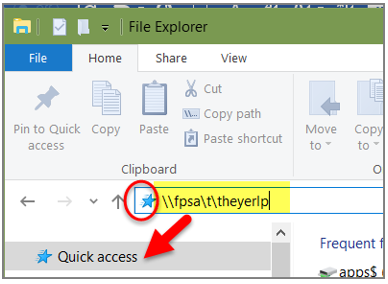 Click on the icon in the Address bar and type the address for your m:\ drive: (for example: \\fpsa\s\smithj \\fpsa\d\darwinj). Then drag the location on top of the Quick Access location to pin it. 3. Department shares can be added using the steps listed above in Step 2. 2. If this laptop is a secondary machine, the most reliable way to use Outlook on is to use Outlook OWA. G) Installing new software - Using "Make Me Admin"
To protect your laptop, we have disabled users as the "local administrator". You will not be able to install new software. If the need arises, use the "Make-Me-Admin" app located on the desktop. This app will allow you 15 minutes as a local administrator. 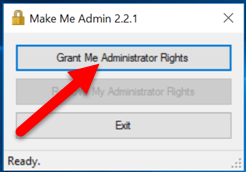 Click on "Grant Me Administrator Rights"
NOTE: In 15-minutes a screen will pop-up saying permissions are being removed. H) Have you Changed your Password? 1. 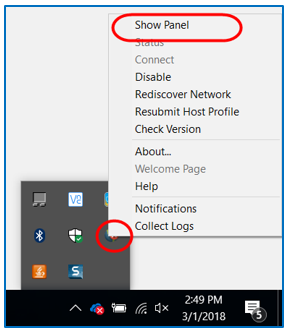 Expand the action bar, right-click on the VPN icon, select “Show Panel”. 2. Click on your username icon, click OK to clear the saved credentials. 3. Enter your new Username and Password, then click connect. Close the GlobalProtect window. 1. 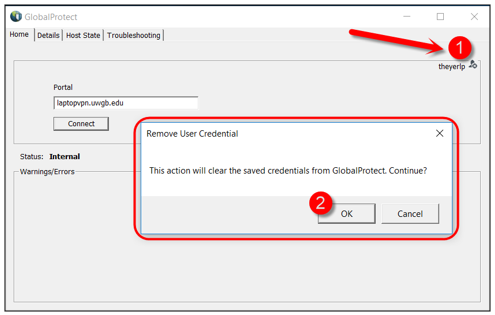 If you receive a pop-up displaying a message about a GlobalProtect Update, you must click Yes. If you do not, you will likely experience issues using the laptop. The update will install itself in the background, and you should wait a minute or two for it to complete before you begin to use the laptop. 1. If you are connected to a network that has a captive portal, such as a hotel, you must first connect to their network by connecting to it as you normally would with WIFI. 2. Once you pressed connect and are "connected", you must then open an internet browser if one hasn't been opened for you. 3. You then need to log into the web browser window, and after you have done this, your VPN will then be able to connect. 1. You can install most programs used at UWGB by searching "Software Center” in the bottom right hand corner of your screen.